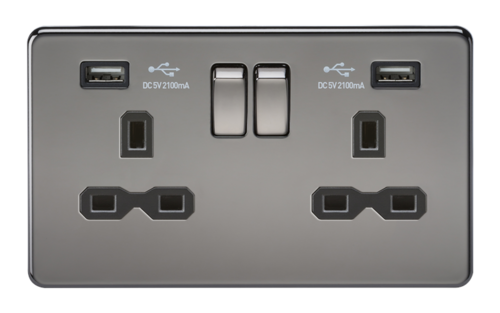 The Knightsbridge SFR9902BN / SFR9902BNW 13A 2G Black Nickel Switched Socket with Dual USB is ideal for use in the modern home, businesses and hotels. The screwless design features an easy clip on cover with an internal gasket for moisture protection and matching screws. It has an ultra slim profile and is constructed from durable, and high temperature resistant thermoset plastic.